Includes solid fronts. Two built-in book compartments. 13-gauge steel corner braces. Adjustable glides for accurate leveling. Solid ash legs and apron. Rubber liquid protecting boots. 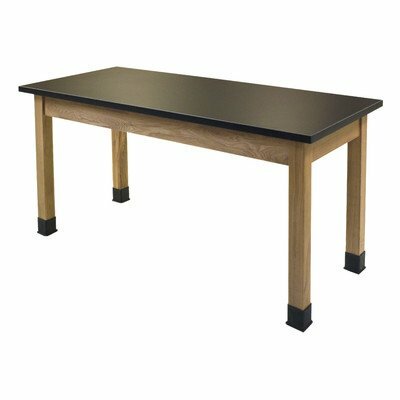 High pressure laminate chemical and water resistant tabletop with 1.13 in. thick core. Warranty: Five years. Made from wood. Black and natural finish. Compartments: 14.25 in. L x 12.75 in. W x 4 in. H. 48 in. L x 24 in. W x 36 in. H. 54 in. L x 24 in. W x 36 in. H. 60 in. L x 24 in. W x 36 in. H. 72 in. L x 24 in. W x 36 in. H. 60 in. L x 30 in. W x 36 in. H. 72 in. L x 30 in. W x 36 in. H. Assembly Instructions.